This well-trained young Andalusian was the personal horse of a Spanish riding school master. He has done exhibitions and shown through Prix St. Georges in Wellington. Oro, which means gold, has received 9's for his extended trot and 8's for his walk tour. 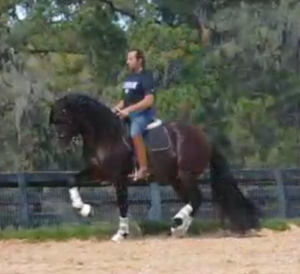 He has all the components of the Grand Prix work and shows good piaffe, passage and transitions between them. This horse is super comfortable to ride and hacks out very confidently alone. 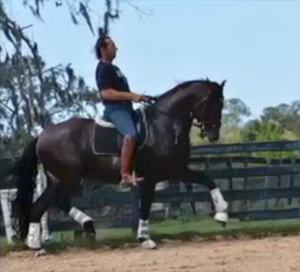 A rider can choose to keep him in a lower level frame or ask for high collection and dial up for the Grand Prix work with very little effort. He has a clean PPE from 2018 and requires no special care or shoeing. Although very sweet and simply managed, this would not be an appropriate mount for a beginner or an amateur who has no help. He is not yet a true schoolmaster. This is not an alpha horse and he has never been bred. We have him stabled next to mares. 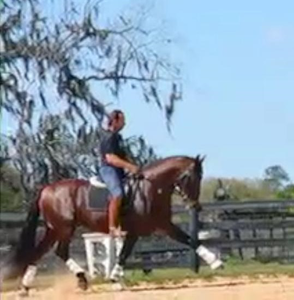 So many pieces of the training that can be tricky for warmbloods are a piece of cake for this gorgeous boy. Consider making him your next dance partner. 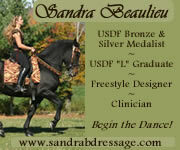 In the right training program, he is capable of exceptional, competitive FEI tests. One judge called him "amazing"! We have many videos and photos available to send to you privately. Viewed 306 times since 2/10/19.